Hello everyone, and welcome back to my blog. I can’t believe it’s December already! Where has the year gone? I hope this has been a good year (Magic or otherwise), and that you all enter 2018 in good health. Today I want to get back to writing about tournament level decks, and to bring us back to that level of discussion I’ll be writing about a deck I have not played a lot of, but just recently got back some of my cards from having them signed by the artist. Those of you who have been following me on Twitter or Facebook know that I get my Legacy cards signed by the artist. These cards are often the original printing of a card, however in the deck we’ll talk about today some of the cards are not Beta but Ice Age instead. As you have guessed by now that deck is Death & Taxes. The deck runs on several key cards to power out it’s threats. Part aggro, and part prison Death & Taxes attacks on multiple fronts. The amount of creatures present may not feel like it attacks in other ways, but it can lock people out while still allowing you to play threats. Æther Vial is perhaps the primary card in the deck. During each upkeep you may put a charge counter on the vial, and that represents the converted mana cost of creatures you can put into play (at instant speed) with Vial. With cards that have “enter the battlefield” triggers Vial can provide you many ways to perform instant speed tricks. While this deck does not have a way to ramp what it can do is prevent the opponent from casting spells on time. Taxing effects can effectively give you extra turns to deploy your threats, and while Thalia, Guardian of Thraben can tax you it doesn’t happen as often as it does with your opponent. Rishadan Port can keep your opponent off of a color on their upkeep, and Wasteland honestly is an instant speed land destruction spell. These three cards can get you ahead of your opponent while providing some early hits. Don’t discount the power & toughness on Thalia. Two to three hits from her adds up quickly. These two cards help support your main pieces. Stoneforge Mystic provides equipment to make your creatures bigger than your opponent’s, and helps you stay ahead of any damage race with that equipment. Mother of Runes provides protection to force your creatures through, or creates a wall to keep you afloat vs other aggro decks. While appear to be simple these creatures have lines of play that aren’t really linear, and you can do powerful things on your opponent’s turn. 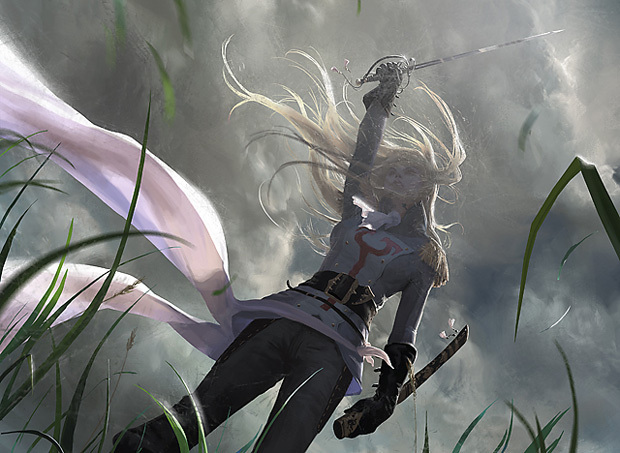 With White being one of the best colors for sideboards in the history of Magic you have a suite of 15 cards that can hate out against many matches. Containment Priest can be used vs Elves, and along with Rest In Peace & Faerie Macabre can be used vs Graveyard decks. You have extra removal in Path to Exile, can further tax your opponent with Pithing Needle, and pressure control decks with Gideon, Ally of Zendikar. Manriki-Gusari is a nod to other equipment, especially Umezawa’s Jitte, and helps keep the opponent’s creatures unarmed. In Standard I used to play Caw-Blade (who didn’t), and years ago I had a White Weenie deck that had White Knight (among others) in it. Once I discovered control & tempo decks I abandoned aggro although I still play some aggro decks from time to time. The power of this deck, along with the pressure it applies, can be a lot of fun for those who want to play a fair deck that can constrict your opponent through said fair play. It took me about two years to build. I could have finished it sooner if I devoted some time to this, but now that it’s done I can get some games in with it in Legacy. With Miracles gone (since the ban of Top) I wanted to have a really solid deck to play while I pick up other Legacy cards and finish some other decks.